Three Things Thursday is a weekly tribute to being grateful for the good things in life. This tradition was started by Emily of Nerd in the Brain and is currently hosted by Natalie of There She Goes. First and foremost, a big thank you to Jan of the wonderfully creative blog The Snail of Happiness. Not only does her blog inspire me, but in her current Three Things Thursday, Jan expressed gratitude for receiving in the mail—ta-dah!—Maya and the Book of Everything. Jan, thanks so very much for the shout-out! Second, raindrops on flowers. Roses aren’t the only flowers enhanced by raindrops. Note to readers: From now through September, flowers will most likely figure in my Three Things Thursday posts. As I’ve mentioned previously, I am a fool for flowers. Third, my wee herb garden. It is small but mighty, and oh, how it produces. 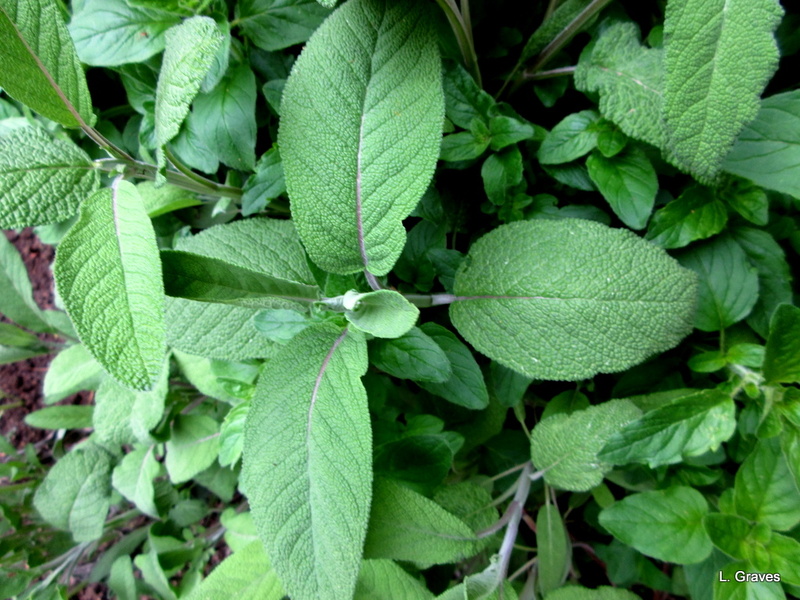 Sage, oregano, mint, and thyme have wintered over and are now growing in abundance. What to do, what to do? 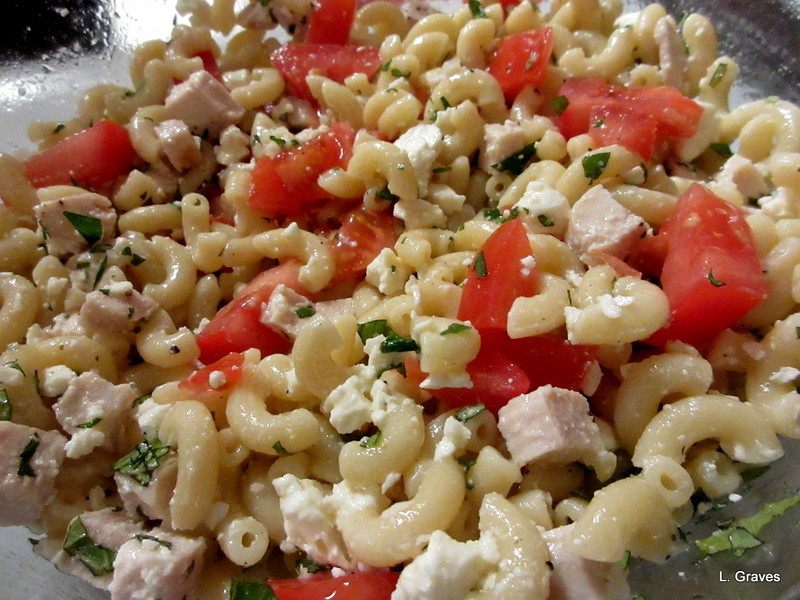 Well, I made a macaroni herb salad, a simple dish that can be adapted to whatever you have kicking around your refrigerator or freezer. I cooked two cups of macaroni, mixed in a liberal amount of olive oil, three tablespoons of mixed chopped herbs (next time I will use more), salt, pepper, and many squeezes of half a lemon. Then came cubed chicken, crumbled feta, and chopped tomatoes. I also used a clove of roasted garlic. Next time I will skip the garlic as it tends to overpower the delicate taste of the herbs, lemon juice, and olive oil. What else could you add? Sliced red peppers, olives, carrots, celery, any kind of green. Chickpeas. Roasted walnuts. The list is long. Stay tuned for more recipes using herbs. I’m really looking forward to reading Maya… and I’m jealous of your sage, mine is on its last legs! Thanks so much! I’ve had to replace the sage over the years, but this winter it did really well. Who knows why? I know! Wish you lived closer! Many thanks! And you’re most welcome. Oh, keep the herb recipes coming. My little herb garden is also giving me lots to work with. I love my herbs! They look good, smell good, taste good and the bees, butterflies and other insects love the flowers. 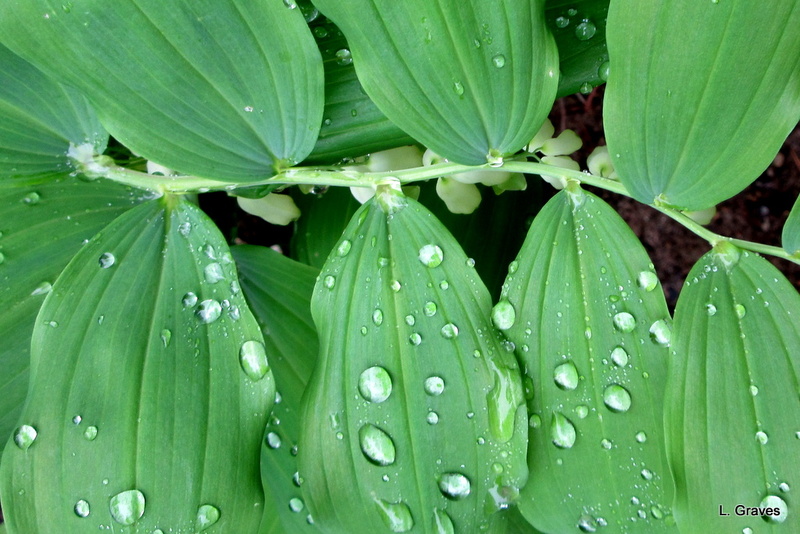 Your photos of raindrops on your flowers are wonderful. Thanks, Clare! Herbs will jazz up even the plainest meal. Love them! I LOVE my herb garden. I will be drying and freezing more herbs this year. The flavor is so much better than store bought that it’s startling. Yours look very happy. Herbs are great! My herbs do look happy. As I wrote, it’s a small but mighty garden. Oh, that recipe sounds delish. We’re big fans of pasta salads, though lately, the pasta is replaced by new potatoes. So much goodness in one bowl. Your herbs and iris looking lovely too. Happy weekend Laurie! 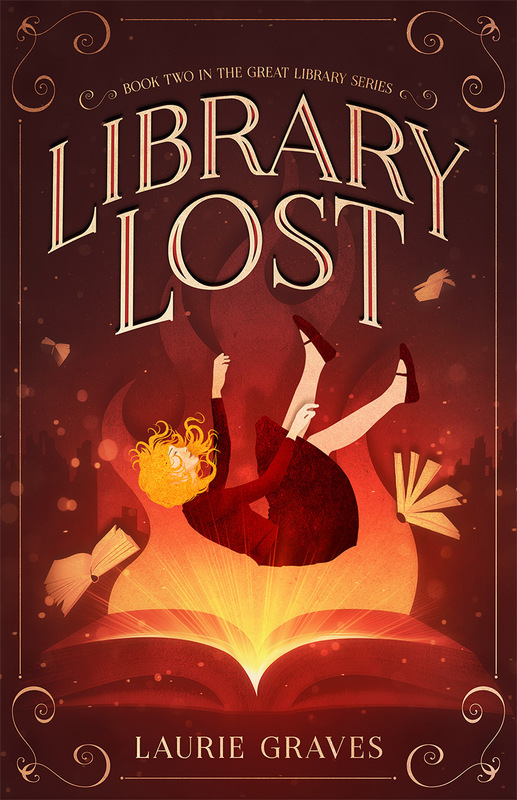 It really is pretty darned good and pretty darned flexible. And a happy weekend to you and yours. Love raindrops on flowers– makes them even MORE beautiful, if that is even possible! Thanks, Eliza. It wasn’t too bad, as my Yankee husband would say. Salad looks great, and you captured the water drops on the flowers beautifully. 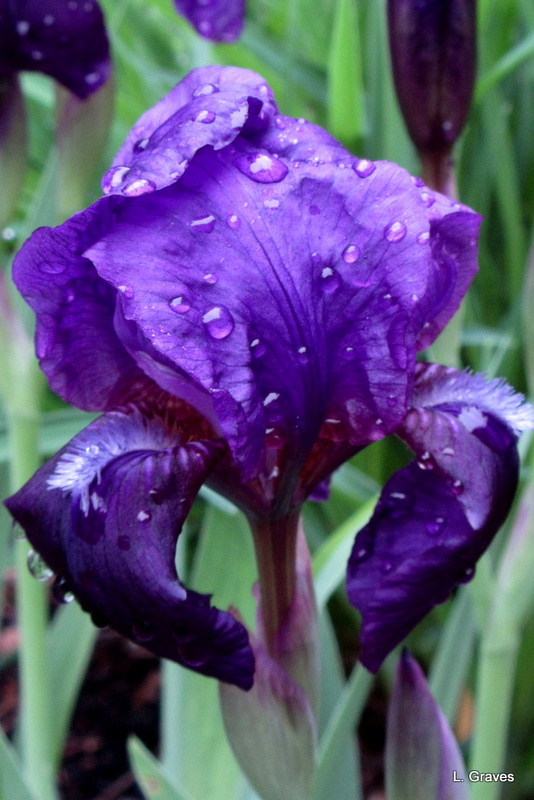 The raindrops on the flowers, especially the iris, are lovely. We have a good herb garden here too, and they go into a lot of dishes. Many thanks! Love those herbs!